A truly world-class source of sheet music, scores, and music books. The actual store is located at 307 Forest Avenue in Pacific Grove, and they also have internet customers all over the world. Visit their great website for details. Peninsula Reviews features reviews of classical music concerts, previews of upcoming classical music events, and a periodic newsletter. Pianist and teacher Lyn Bronson is the publisher and editor. Performing Arts Monterey Bay was created by music writer Scott MacClelland. The site covers live music, dance and theater, open to the public, in Monterey and Santa Cruz counties. 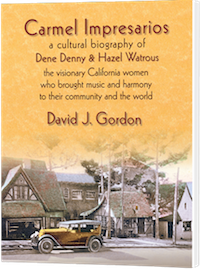 A cultural biography of Dene Denny and Hazel Watrous, the two extraordinary women who created Carmel Music Society (1927) and the Carmel Bach Festival (1935) and were central figures in Carmel's artistic and architectural development in the years before WWII. Includes a detailed study of music and theater in Carmel's earliest decades. 400 pages, 300 vintage illustrations, a century of history, fully footnoted and indexed, extensive Appendix and Bibliography. Available online and locally. Click here. San Francisco's KDFC is one of the most popular classical music FM stations in the USA. It is listener-supported, all-classical, a service of the Universty of Southern California. We welcome additions, suggestions, and corrections to this list. Please send updates to the webmaster.